He's said to have been 'blocked' from contacting his ex-girlfriend Katie Price following their split three weeks ago. 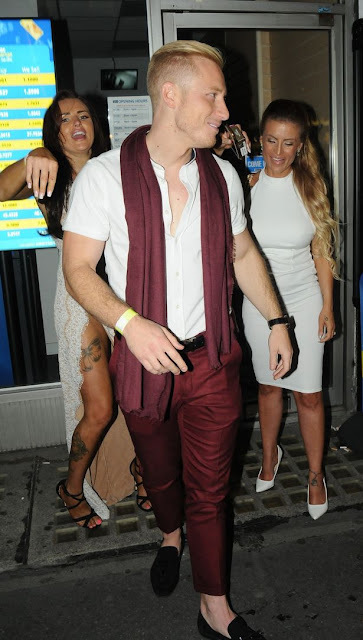 However, Kris Boyson looked far from heartbroken as he partied with a host of Page 3 girls at the UK Glamour Awards on Thursday. The fitness trainer, 29, was spotted surrounded by models as he left the glitzy bash at Spearmint Rhino in London's Fitzrovia. His late-night outing came after a source close to Katie claimed she had blocked Kris on social media and by phone after he "bombarded" her with calls and messages. A source close to Katie spoke out following a report earlier this week claimed the mother-of-five had been trying to reconcile with Kris, despite her current romance with Essex businessman Alex Adderson. "She is sick of him selling stories on her to make himself look the victim. She is really happy in her relationship with Alex but is sick of Kris' desperation."